Most all of the areas small lakes and reservoirs are frozen over and safe to walk on. 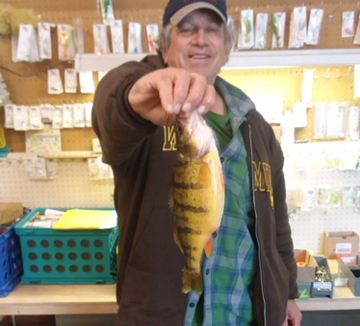 Jeff Posivio reported catching trout and perch in Crow Reservoir. So far no reports from the other bodies of water. As of yesterday people were out on Lake Mary Ronan. A good part of Polson Bay is ice-covered but the only part that I’m aware of being safe is East Bay. Because of the ferocity of the artic front that brought in the cold weather the bay was muddied up and is just now clearing. Searching for fish over a large part of the day I finally found them in front of the RV Park in the southeast corner of the bay. The fish were a little sluggish but with water clarity improving their activity lovel will increase. The one point worth noting is that all the fish I saw and caught were large. 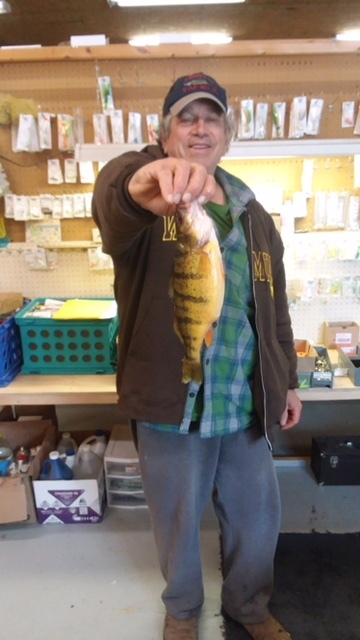 (See picture of a 13incher) There may not be the numbers that there were last year but thanks to the many fishermen who have thinned their numbers it looks like less food competition has given them good growth rate through the summer. Check out our website and we have a facebook page coming soon after the first of the year. Thanks for all your many years of support. Good Fishing and Happy New Year.